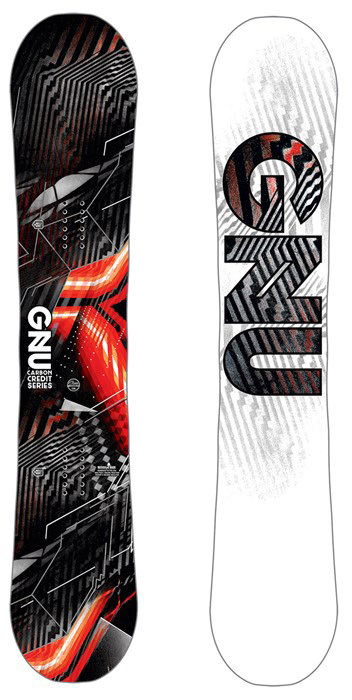 The Gnu Carbon Credit Asymmetrical is a nice evolution of the Carbon credit and a great entry level freestyle board for those that know they want to make their way to the park. It’s also a great board for riding in harder conditions. Not much changed from 2017-2019 except this is the only Carbon Credit option now. Conditions: Great mid winter Sierra conditions. Set Up: Centered close to 23″ 15 front -15 back. Approximate Weight: Felt normal bordering on being a touch heavy. Flex: Kind a medium/soft bordering on medium flex but on snow it feels a bit softer as it’s super easy to butter. We try to get as many images of the Gnu Carbon Credit Asym, but forgive us if they're not all there. This board is a real gem. I I can say it is a allmountain board. Very good value for your money. It can handle everything from carving to park riding to pow decently. Of course if you want an all mountain-freeride specific board you can look for a gnu mullair but for a much higher price. The good part of this board is that it does not empty your pocket, very affordable, but at the same time a very decent nice board.